Our integrated network of worldwide services assists security-device manufacturers in gaining smooth access to the markets of Europe, Asia, the Americas and the Middle East. Manufacturers can now also take advantage of the new UL Security Laboratory in Frankfurt, Germany – a local resource with global reach. 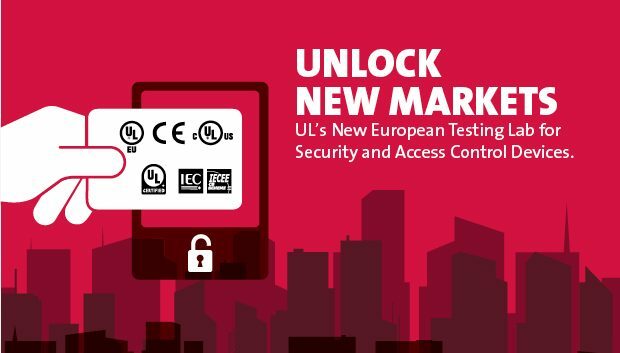 This new European laboratory provides access to UL’s extensive European testing and certification network, as well as to UL’s globally respected compliance expertise for access control, burglar alarm controls, intrusion sensors, ballistics, locks and other electronic and physical security products. A single submission to a single organization and a single point of contact together dramatically simplify the process of testing and certification for global markets. Service bundles eliminate redundant testing, which can speed the process and lower the cost for manufacturers. Early engagement in the product development process helps manufacturers better manage risk. Our Security Lab can also customize testing to help evaluate new and innovative products, speeding up their development and their arrival on the market. Location – manufacturers benefit from a European location. Efficiency – streamlined, combined services help reduce expenses. Value – a single point of contact leads to global market access. UL in Europe offers fast and simplified global market access for your products. We know the industry. We know the technology. We know the rules, and we know most of the major manufacturers. So we can offer streamlined assistance that helps to cut costs and save time. UL’s new Security Lab in Frankfurt is your portal to the world.